Prepare yourself. Protect your people. Attending the ALICE Training Seminar sponsored by Church Mutual was the first step. The next step is your decision to implement ALICE training to prepare your people. Lives can be saved and financial and legal risk can be mitigated as a result of you taking action to implement ALICE training. Adopting our blended training model will prepare your people with response options that can increase their chances of survival during an active assailant event. The first step is to provide the ALICE House of Worship e-Learning course to your leaders and congregants. The training builds the basic understanding of survival options and starts to create a quick response mindset. It allows for quick, consistent, and quality training. The course provides people of all ages and capabilities with options they can pursue when exposed to danger with no professional help at the scene. Most Violent Intruder events are over before the police arrive. It is during this critical phase of the danger when lives are saved or lost. The overwhelming factor determining the ratio of survival will be what did the people under attack know to do. This will be determined by what training did they receive, and what practice had they engaged in to forge a belief in the knowledge. The ALICE e-Learning course provides the basis for more intense, optional learning afterwards. Upon completion of this interactive training course you will receive a digital certificate of completion of training. Approximate time to complete this certification is between 45-60 minutes. Onsite training enhances understanding of response options through hands-on demonstrations. 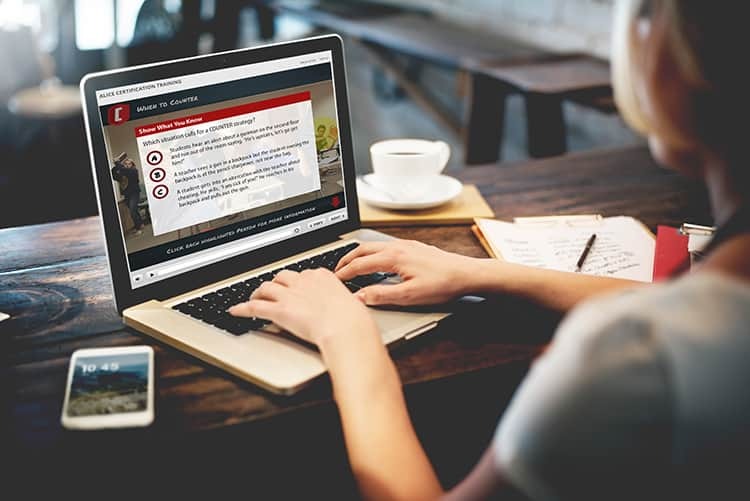 Following e-Learning certification with on-site training is critical to maximize readiness. While e-Learning involves two of the three learning methods (audible and visual), kinesthetic learning is equally important. Congregations may conduct optional sessions where these learning and practice activities can take place, coordinated by an in-house or other local ALICE Certified Instructor. These sessions build better belief in the benefits of the recommended strategies, and the value of the collective in working together to ensure the safety of everyone. ALICE Certified Instructors conduct these exercises in a manner to create a sense of realism while maintaining high degrees of safety. These sessions can be conducted in a 2-hour block.